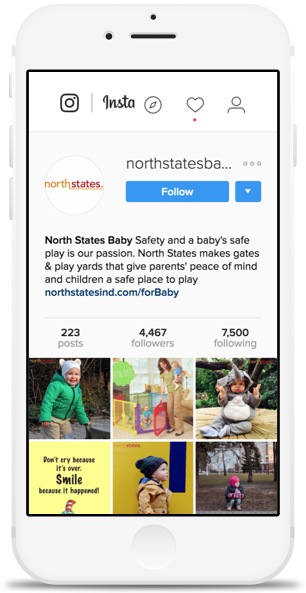 North States Industries creates and distributes creative safety gates for children and house pets—providing secure play spaces that protect and entertain. This employee-owned company leads the juvenile and pet gate industry with innovative products that prioritize safety and durability. And while business was booming, the brand’s social presence was sorely lacking. North States came to Snap with aspirations to bolster its social channels and direct prospective customers to its website. Inspired by these goals, Snap’s team set out to create fresh social tactics to meet and exceed them. Our objective was to create and optimize a handful of social media platforms to foster brand awareness and followers, all while driving traffic back to the North States site. Empowered with sound strategy and adorable content, Snap’s Social Media Team worked its magic, building three engaging social platforms to spread the word about North States and engage followers. Thanks to Snap’s cohesive multi-platform social media strategy, North States saw significant increases in both organic and paid growth within a 12-month timeframe. Animal companions and babies rejoice! With the support of its strengthened social channels, North States is connecting with more guardians and parents than ever before—creating safe and fun play spaces for juveniles and four-legged family members alike.